You are here: Home / Blog / Weaving / Pin Loom Weaving Books, Which Should I get? 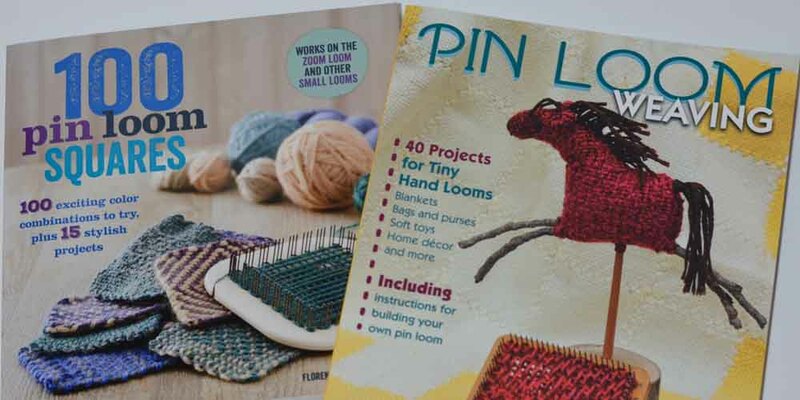 Pin Loom Weaving Books: Which Should I get? You have a pin loom or two (or you are putting together an order for some) and you just aren’t sure which pin loom weaving book to get. Allow me tell you a little about both Pin Loom Weaving by Margaret Stump, and 100 Pin Loom Squares by Florencia Campos Correa. Pin Loom Weaving is a 11″ by 8.5″ softcover book with 124 pages. It starts out talking about tools and supplies, and then goes into how to make your own loom using plywood, music wire, and standard woodworking tools, including a drill and handsaw. It includes templates to make 2×2, 2×4, 4×4, 4×6 and 6×6 pin looms. The patterns in the book use a variety of these shapes, with 17 of the projects using only a 4×4 loom such as the Zoom Loom (so that’s a great size to start with!). It then covers yarn selection, basic weaving with drawn diagrams, and gives instructions for 7 different square textures. A handy section has very basic crochet instructions, and how to use crochet and stitching to join and edge your squares. Chapter 2 has patterns for 12 bags or cases, including a knitting bag, tablet case, and sewing kit. Chapter 3 is Gifts and Home Decor, with 10 projects. The Ducks and Loons are adorable, the dishcloths are useful, and the pictorial wall hanging will inspire you to see all quilt patterns as fair game. Chapter 4 is Blankets, with 7 blankets patterns using color piecing and/or embroidery designs. Chapter 5 is my personal favorite, The Farm Set. Including the Amish farmers, barn, cows, chicken, pigs, cat, sheep, horse, and dogs, it’s definitely on my “to do” list. The Dog, Chicken and Cats can be done with just a 4×4 and 2×2 loom, while a 2×4, 4×6 are also needed to do the Pig, Sheep, Horse, Cow and People. It wraps up with 2 pages of acknowledgments and resources. There are quite a few color pictures in the book, mainly of the finished items, with color diagrams for many of the projects as well. 100 Pin Loom Squares is a 8.75 x 8.5 softcover book with 144 pages. It starts out with the Forward, How to Use this Book, Getting Started, and History of Pin Loom Weaving, and by page 16 it goes into the instructions on how to build a wooden 4×4 pin loom using strips of wood, nails, and glue. Then it goes into setting up the loom and weaving techniques, with photo instructions. By page 26 the magic starts. Page after page of creative and versatile patterning techniques, shown on the 4×4 loom. With color pictures on every page, it covers different warping methods, and detailed step-by-step directions of the weaving process. You will then be refereed back to which weaving technique to use, and how to arrange the colors for the square you choose. After a short break to talk about joining and finishing, as well as yarn choices and colors, the book returns to the “gallery of squares” that use the techniques taught in the previous pages – to make a flurry of design options! With section titles such as “The Power of Contrast,” “Earth and Fire,” “Cool Neutrals,” and “Novelty Yarns,” you will be shown how to use color and warping/weaving order to create the variations. After all that (whew!) now the book enters into the Projects. Using all 4×4 squares with various patterns and textures, Florencia shows us how to make Wristbands, Fingerless Mitts, A Hat, Infinity Scarf, Slippers, Poncho, Sweater, Bag, Hairband, Gadget Case, Throw, Tote Bag, Pillow, Lampshade, Cushion, and Dog Coat. The book wraps up with 2 pages of resources, a 2 page index, and acknowledgments. So, my summary? They both have a place on the bookshelf, but if I were to start with one book, I’d go with 100 Pin loom Squares as I feel it shows the “how” of basic weaving best, and keeps you focused on one loom size as you learn the process. Once you master the basic square and color patterns, then Pin Loom Weaving will lead you in learning to use other sizes of pin looms to make more detailed and intricate projects. 100 Pin Loom Squares is great for taking one loom size, and exploring its possibilities in both design and texture, as well as starting you off on how to use those squares for completed projects. Pin Loom Weaving uses a wider range of loom sizes, which makes for more detailed projects. Using the two books together, the possibilities are endless!